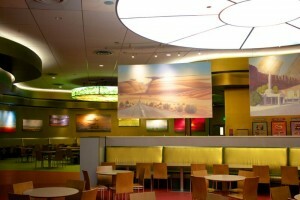 This is Part 2 of a series about taking parents to Walt Disney World. You can read Part 1 here. Thanks to the folks at the WDW Today podcast, I was able to put together a timeline of things that my parents and I will have to do to prepare for our Walt Disney World trip. I put it together in August and sent it to my father…and then completely forgot about it. Suddenly a couple of weeks ago, I realized that some of those things on the timeline were quickly approaching. I called up my dad and we discussed a few things concerning our lodging. With his input, I know that we made some good choices. First of all, my parents wanted to keep costs low, for the most part. This wasn’t going to be a once-in-a-lifetime, spend-all-the-money, splurge-on-everything-type trip. With that in mind, they also wanted to stay on property. My dad knew the cost ranges of the hotels (I bought him the current Unofficial Guide book so he could research) and where they were located. Lisa M, a commenter from my previous post, mentioned that her family stayed at Disney’s Art of Animation Resort and really enjoyed it. I had already been thinking about this location myself and suggested it to my father. I also told them about the other budget resorts, Pop Century and the All-Star Resorts. 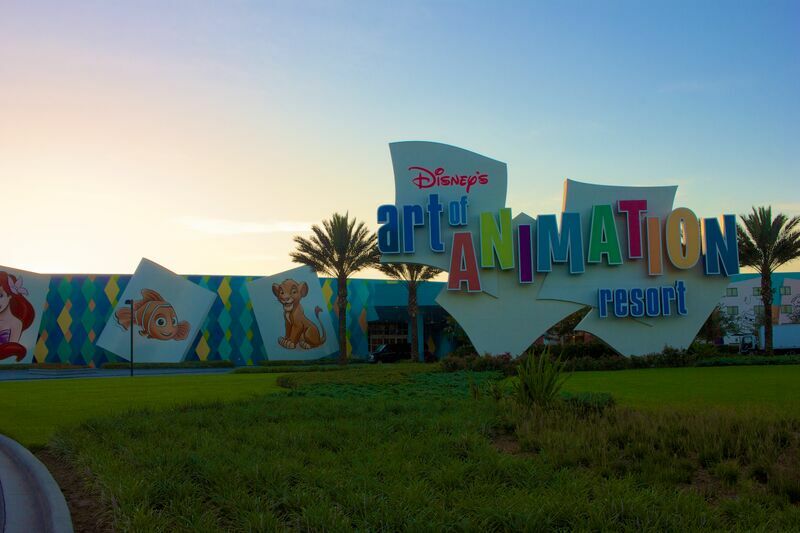 Art of Animation is the newest of those, and while I have enjoyed my past experiences at Pop Century, I recommended giving Art of Animation a try. 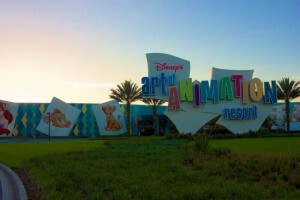 He and my mom decided that for most of the trip, we would stay at the Art of Animation Resort in a standard room – a suite wasn’t necessary, so we could reduce costs that way. There were several perks to this choice. We would be using a rental car, for the most part, but having reliable transportation was a plus. (Most of the budget resorts, due to their size, have a lot of buses routed to those resorts.) We also could take advantage of the nice food court (called Landscape of Flavors) that Art of Animation has, while also utilizing their mini-refrigerators to keep breakfast foods cold and save some money on morning meals. My parents also decided that they wanted one night at a moderate or deluxe resort. For this one, they asked me where I thought we should stay. I have been inside many of the deluxe resorts that are on Disney parks property, and I love the Polynesian and Wilderness Lodge resorts. However, I also took into consideration one of the things that can ruin a vacation: the time it takes to go from the parks back to the resort. Waiting in line for buses or monorails or boats or trams can be a major hassle after a long day in the parks. 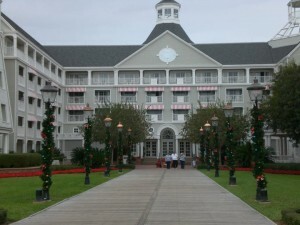 So with that in mind, I recommended my favorite Epcot resort: Disney’s Yacht Club. This one has always reminded me of the lighthouses and beaches of the Great Lakes (I’m from Michigan), and that atmosphere is very calming and peaceful. Out of the Epcot resorts, it’s the second-closest one to the International Gateway (about a 10 minute walk, depending on where your room is) and will be great to retreat to as we finish up a night in Epcot’s World Showcase. I also wanted to take advantage of one of the best resort pools on property, Stormalong Bay. My mother loves her swimming pools (she might deny it, but I think the reason we always stayed at hotels with pools was because of her) and I think she would get a real kick out of Stormalong Bay. Our final night in our park hopping will be at Universal’s Cabana Bay Beach Resort. I wanted my parents to be able to enjoy the Harry Potter experience without feeling too rushed, so I chose to stay on Universal property so we could use their early park admission and get in an hour early. Cabana Bay is the only value resort that also offers this bonus. 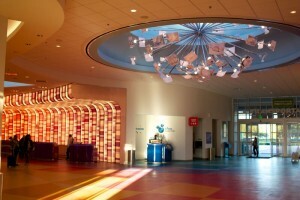 Cabana Bay also offers a great atmosphere of vintage 1950s and 1960s designs which I’m sure both my parents will enjoy. The distance to the parks is also a plus – we could take a bus or walk to Universal in about 15 minutes. Since this will be near the end of the trip, my parents will appreciate the close proximity, as well as being able to sleep in a little bit later! My family is trying out some new things on this trip when it comes to lodging. While they mainly are just looking for a good place to catch some zzzs, they are also looking forward to a few upgrades that will help them make the most out of their Disney trip! If you could upgrade your resort hotel, where would you stay? 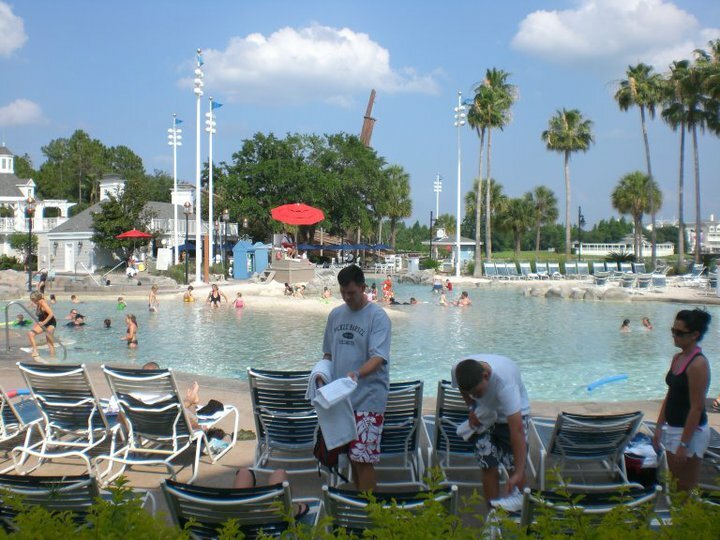 What are the must-haves when you stay on Disney property? Please comment below! Hi Claire, great posts! Taking the parents is a whole different experience, but so rewarding. On our last trip, we took my parents (early 70s) and my husband’s mom (mid-80s). The energy level is so important. My MIL is in great shape, but she tires sooner. She was happy to be there at rope drop, but needed a nap after lunch, then went back for nighttime fun. My parents can keep going longer, but have walking issues, so it was harder for them to take a break at the resort and go back, so instead they stayed longer in the parks, then retired for the evening. It was challenging. Cabana Bay is great, the family suite is so much fun, a little extra room, 2 tvs and a kitchenette, and a sliding door to separate the beds and the sleeper sofa. Don’t know what month you’ll be going, but Cabana Bay doesn’t offer the free Express Pass to Universal that the other 3 resorts do. Won’t make a difference in off times, but in the summer, it surely will. Enjoy!! forgot to mention, if your mom loves pools, she’ll love Cabana Bay. Lazy river, anyone? Thanks for the notes! I don’t mind that Cabana Bay doesn’t offer the Express pass (the Harry Potter stuff, as of right now, doesn’t even allow it) – I just wanted the early entry. 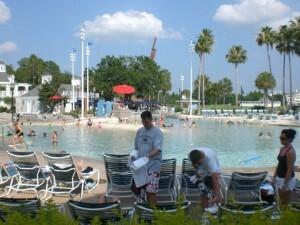 And lazy rivers are AMAZING! I’ll have to make sure to take some time for that! That’s not exactly true. Flight of the Hippogriff and Dragon Challenge both allow the Express Pass. I realize most people don’t go to Hogsmeade or Diagon Alley for those, but they ARE in TWWOHP and do offer Express Passes. Is this meant to imply that Disney bus service is more reliable than a rental car (that’s certainly the way it reads to me)? If I had access to a rental car, I can’t imagine using the buses.